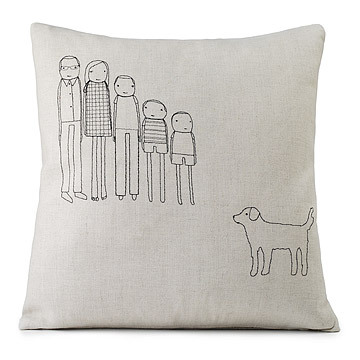 This personalized, hand-embroidered hemp pillow features stitched illustrations of your whole family. This embroidered pillow piles the whole family onto the couch without cramping your style. The ultimate creature comfort, featuring customized figures for all the characters under your roof. Handmade of cotton and flax by Mary and Shelly Klein in Grand Rapids, MI. Shelly Klein lives and works in Grand Rapids, Michigan, where she graduated from Kendall College of Art and Design. She earned a BFA with an emphasis in painting, and has since divided her time between painting and designing for her product line. The two disciplines often overlap: Shelly’s painted illustrations are used to decorate her product designs. Working with UncommonGoods has helped Shelly produce pieces beyond the manufacturing capabilities of her own studio—and it allows her to connect with a large audience of art lovers from around the world. Removable, zippered cover may be dry cleaned or hand-washed. This is a made-to-order item. You will receive a proof within 1-2 business days from our custom order team. At that time, you can request a revision or approve the proof. You will be provided with a ship date for the final item after approving the proof. If we do not receive a response within 1 week, your proof will automatically get approved and your order will be put into production. This item typically ships 2 weeks after proof approval.At this time, this item cannot be shipped to P.O. Boxes or to APO/FPO or US Territories. Contact custom@uncommongoods.com with any questions. looks just like the proof. Received proof in timely manner, allowed me to make a change, and then had it out by the original ship date. The cover is soft to touch. The entire family is happy about our new hipster family portrait! It is so funny and cute. My dog is a bulldog and the dog character I chose looks pretty close. I wanted to add a marking to the dog design to make it match my dog's markings. I used regular black thread and needle. I was grateful for the zipper bottom opening so that I could easily do this. It will also be nice when the time comes to clean the pillow. Thanks so much! Really high quality produce - just like in pictures. Order design was confirmed with me then quickly made and shipped. Great product, great service! It looks great! My wife loved her anniversary gift. It's more decorative as opposed to practical, but it's a great, unique artistic addition to our home. Love these pillows in the formal living room to soften the look and have first class art seen- and meaningful art as it is our family. Very nice design overall. I felt the product received was a little over-priced. This becomes especially evident when one requests a minor adjustment to the design proof. I had the tails on the dogs cropped to look a little more like our Boxers. It cost me an extra $15 to use less thread in the design. The delivery time was as advertised... keep that in mind when ordering against a deadline such as an anniversary! Despite the cost and delivery time, I still recommend this seller and their product. Makes for a great cotton anniversary gift. Very nice design for my decorative pillow. The look on my husband's face when he opened this was priceless. The pillow is 100 times cuter in person than on the website. It arrived early and in plenty of time for Father's Day. It's not inexpensive for a pillow (which is the only reason I gave it 4 stars) but it is a very special gift that anyone would love.